Broken teacup? Don’t worry, it happens to all of us. Luckily, there’s a beautiful way to fix those broken cups and have them looking better than the original. Kintsugi art is a simple way to fix your ceramics with easy to find materials (or you can buy everything you need in a Kintsugi Repair Kit here). 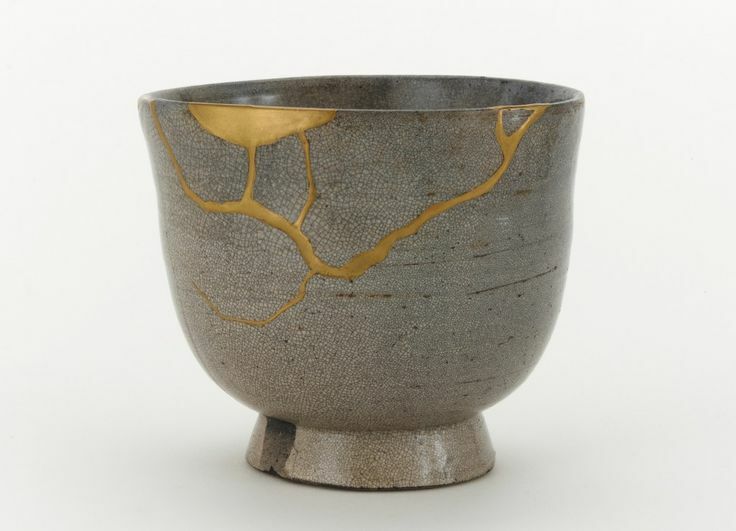 Kintsugi is an art based on the Japanese principal of Wabi-sabi, a view that embraces and celebrates the beauty of imperfection of an objects history. This concept was derived from traditional Buddhist teachings, and involves repairing broken pottery and ceramics with a lacquer that’s been dusted or mixed with gold or silver colored glue to highlight their imperfections. First, you’ll need to break your ceramic/porcelain pot. Wrap your pot in your sheet or blanket, and drop it. Fewer clean breaks are better than shards, so a drop of a couple of feet should be enough. With safety gloves, start to put your broken pieces back together to get a rough idea of how your pottery will look. Once done, put aside in order and get ready for the fun part. Mix Epoxy with gold mica powder in your plastic container, and use a Popsicle stick to generously apply your mix to the edges of your broken pieces. Before the Epoxy dries, firmly press them together and hold. We recommend doing one break at a time, as Epoxy dries pretty quickly. Step 4 is optional as some people prefer “thick” mends while others like to “smooth” them out. If you’d like to smooth your Kintsugi Repair, use a brush to lightly go over the Epoxy before it dries. If you’re looking for a smooth look, use your razor to scrape away the thick parts of the Kintsugi repair. This can be tricky as it may cause some of your Kintsugi to pop out, so be careful.